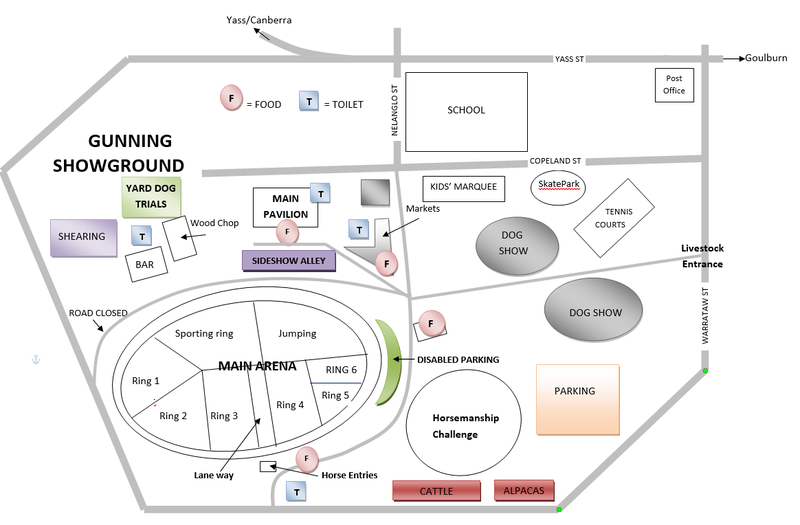 To reserve a stall at the Gunning Show, please complete a stall application form and email it to secretary@gunningshow.com.au. Stall holders will be allocated a stall number which will direct stall holders where to set up. Set up is either on the eve of the show (Saturday) or the morning of the show. Stall cost: $20 for a 3x3 space. Double sites $40 (6x6). Larger sites or promotional displays: are available on application, contact the Secretary for cost and details. Insurance: all stall holders should hold their own $10 million public liability insurance. A copy of your insurance is to be provided with payment to the Show Office prior to the Show. Equipment: The Gunning Show does not provide any equipment for stall holders, stall holders are encouraged to bring their own marquee, table and chairs as required. Power: Power is limited at the Gunning Showground. It should not be assumed that power will be available. Please contact the Secretary for any power enquiries. Entertainment: on arrival, please come to the Show Office to be shown the location for set up. Show Office: the Show Office is located within the main pavilion. Please provide copies of your insurance and payment PRIOR to the start of the Show. Payment: Bank account details are available for stalls wishing to pay online. Please contact the Secretary to access the bank account details. Send completed applications forms to secretary@gunningshow.com.au. Please contact the Secretary on 0417 490 329 for any queries regarding stalls.